One of the more pleasant surprise of the 2011 horror landscape was the emergence of the “Bloody Disgusting Selects” line of theatrical and video releases. A joint effort between a company known as The Collective and (of course) our friends at Bloody Disgusting, “BD Selects” hit screens of various sizes with solid acquisitions like Yellowbrickroad, Rammbock, Cold Fish, Atrocious, and (especially) The Woman, but it’s nice to see the BD Selects team casting a wider net and reeling in some weirdly likable horror/comedies like Deadgirl/Cheap Thrills screenwriter Trent Haaga’s Chop. 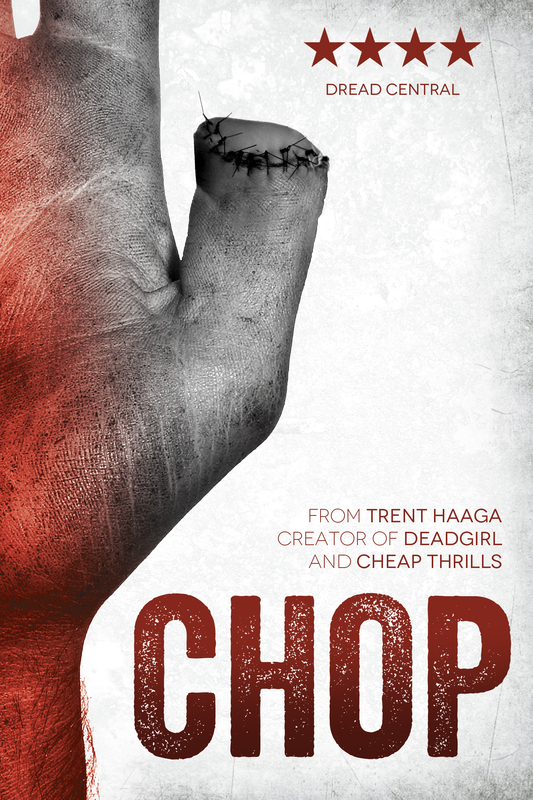 Seemingly inspired by Saw or Hostel or any tale in which a bad man is gradually chopped to pieces by an even worse man, Chop feels like a funny short that was stretched into an 81-minute feature, and while the stretch marks do show (and they’re not always pretty), there’s also a lot to like from the central hook of the flick. Basically, a lunatic has kidnapped a truly selfish man, and the lunatic wants him to admit that he’s sorry for something unpleasant that happened years before. The selfish jerk, in his defense, simply doesn’t remember who the raving madman is, but that only makes matters worse. After witnessing a few horrific murders of close family members, our non-hero starts admitting to things that have nothing to do with the raving lunatic, and that’s where Chop starts to get funny. Oh yeah, I almost forgot I was describing a comedy. In most cases a “horror comedy” is a horror film with quips or pratfalls, but Chop, to its credit, is a dark but broad farce punctuated by frequent geysers of Grand Guignol-style carnage. Not every joke hits its mark, and (again) Chop outlasts its welcome by a few minutes, but at its best moments it seems to be channeling something co-written by Neil Simon and Eli Roth: quick banter and kooky misunderstandings that lead to shocking violence and over-the-top bloodletting. The leads are a bit green – but they’re often as amusing as they are entirely committed to this low-budget lunacy. And while none of Chop is likely to be mistaken for a masterful combination of horror and comedy, there’s always something to be said for an indie flick that can keep both of those plates spinning for the majority of an entire movie. Basically, Chop is the sort of flick you know you’ll click with before the tenth minute ticks by; when it comes to scrappy low-budget genre mash-ups like this one, I try to pretend it’s a movie that a few friends of mine with very limited funds and very palpable enthusiasm made. By that measure, despite the stretch marks and some slow spots, Chop earns solid marks, and I think that all involved parties could do a lot better work with a little more money. CHOP is available to stream or download in the UK here.